"The New Minstrelsy of the Scottish Border"
Just a little over two hundred years ago Sir Walter Scott rode around the Borders collecting and recording the traditional ballads which he proceeded to publish under the title “The Minstrelsy of the Scottish Border” . James Hogg’s mother herself a noted singer of the ballads is reported to have been none too pleased at Sir Walter’s activities and to have claimed that these ballads would never be the same again. Whether or not this might be true, in the intervening two centuries a great many more poetic works have been penned and many of these too were also in danger of being lost or at least not being too readily accessible. At the very least Scott’s work required updating. 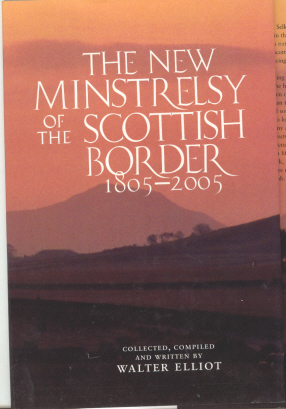 Sensing this Mr. Walter Elliot took it upon himself to seek to bring these together in compilation in much the same way as Scott had done and has recently published “The New Minstrelsy of the Scottish Border 1805 to 2005" being the title of his talk to the Society. Walter opened his talk by giving some background to the original Minstrelsy and also to the work and efforts which had been put into compiling this new volume, recording appreciation and recognition of all who had contributed. He had experienced no difficulty at all in finding works for inclusion; indeed the problem had been in the “redding oot” He had sought to cover as wide a spectrum of Borders life and thought as possible over the two centuries. Rather though than list poems chronologically or by author he had sought to do so by subject matter which is how they appeared in the book. Religion he had placed next to health as cleanliness is next to godliness and similarly he had placed politics next to pollution. He moved on to talk of the place of Scots as a language and particularly of the Borders’ dialect and its history reaching the conclusion that there was no such thing pure Border Scots. Nevertheless he argued it was easier to write in Scots and that the language gave much more scope for fine tuning of a rhyme than was available in standard English. Walter then invited Mrs. Eileen Stewart of the Society to read two poems which she delivered with considerable skill and concinnity, the first appropriately on the problem of language and rhyming, written by the historian Andrew Lang of Selkirk and the second entitled "Spectacles" by Isabella Anderson Gray of Lilliesleaf on the completely different topic of religion dealing provokingly on the schisms within the Church and the proper perception of truth. After reading a number of other poems and keeping the company warmly entertained with anecdote the meeting concluded with another fine recitation from another member, Ramsay Brack, of the poem "The Conversationalist" by Tim Douglas of Rulewater. This poem dealt with the effects of change on the Borders, stressing the need to preserve what is good but also the requirement for change. Although well over his time Walter left the members still looking for more.